16. Got Ducks? Let them loose in your garden to eat slugs all day. Ducks might love slugs they also love tender lettuce and other leafy goodies. One thing I didn't know about them is: Slugs are hermaphrodites, having both female and male reproductive organs. They are also a source of food supply for virtually every other major vertebrate group, so removing them from your garden just because you don't like them, is removing a food source for other creatures. 1. 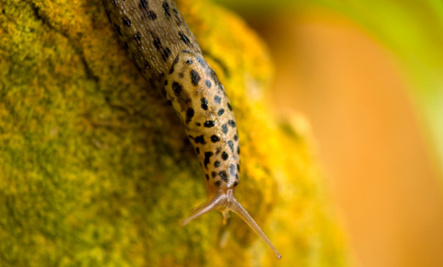 Slugs avoid crawling over anything dry, dusty or scratchy, such as lime, diatomaceous earth, cinders, coarse sawdust, gravel, sand, bark dust or coffee grounds. 3. Spray plants with a solution of vinegar and water. Also removes slug slime. 4. Spread table salt around your plants. Salt dries slugs out so they wont go near it. 5. Collect human, dog, or cat hair and put around your plants. Not only will the slugs not go on it, but it will also keep a lot of the little critters away also. 6. When you find a slime trail, destroy the track so other slugs do not follow. 7. Slugs hate the strong smell of mint, chives, garlic, geraniums, foxgloves and fennel. Plant these around the edge of your garden to deter slugs. These plants also discourage Japanese beetles. 8. Plants that are resistant to slugs include phlox, campanula, hererocallis, and mentha. 9. Put stone paths along your flower beds. 10. Use a biodegradable paper towel to remove slugs from your garden plants. The towel acts like a magnet and the slug will adhere to the paper. Move the sluggy towel to another part of the garden. I've heard that flat beer will attract, & kill them. But I've never had any. I've got more than enough slugs. is there no way to simply drive them off??? poisoning, suffocating, disolving, etc... it all seems vicious and like bad karma to me... is there no other way?? ?